Born in Havana, José Francisco Barroso’s childhood was enveloped in Cuba’s rich artistic and spiritual environment. At a very young age Barroso was dancing the popular Cuban styles of son, casino, rueda, and rumba. Barroso describes these movements as an expression of everyday life in Cuba and as a symbol of the vibrancy of the Cuban people. As a teenager, Barroso competed and was recognized throughout Havana for his skills in the American forms of hip-hop and break dance. Literally discovered dancing on the street corner in Havana, Barroso was mentored by director of Cuba’s Compania FolkloricaRaices Profundas, Juan de Dios Ramos, and rapidly began his journey and career as a principle dancer and soloist of Afro-Cuban dance. Immersed in the dance and music tradition of his ancestors, Barroso delved ever deeper into the significance and roots of his culture. 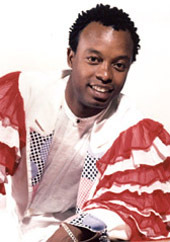 Today, director and choreographer José Francisco Barroso is regarded as among the foremost authorities on Afro-Cuban dance, music, and folklore. His extensive training and dedication yield Barroso accreditation as an Omo Ayán, master of the consecrated Bata); Palo ÑaÑganaga, keeper of knowledge in the Congolese tradition; Omo Elegba, priest of the Orisha Elegbá; and Awo Ifa, high priest of Orunmila. Barroso was a California Arts Council Artist-In-Residence Grant recipient for the years 1995-2000, teaching extremely popular classes for children and adults, in arts centers, community centers, and public schools. In addition to private dance studios, Barroso has taught at several universities and colleges such as California State University Sacramento, San Jose State University, Humboldt State University, San Francisco State University, New College of San Francisco, Laney College, and Mills College. Barroso continues to expand and exhibit his already impressive knowledge of Yoruba traditional practices by studying and collaborating with numerous Cuban and African masters of drum, dance and culture. Jose Francisco Barroso has been awarded the 2006 Isadora Duncan Dance Award for Outstanding Achievement in the category of Individual (Solo) Dance. Jose's dance products are available on Zone Free DVD.